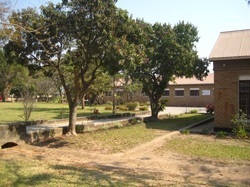 The Art Gallery is part of the Choma Museum and Crafts Centre Trust Ltd (CMCC). The CMCC, often referred to as "The Choma Museum" is located in Choma, Southern Province, Zambia; right along the Lusaka - Livingstone road. Inside the main building, apart from the Art Gallery, are the permanent exhibition room, a crafts shop, a snack bar, toilets and offices. Outside you can relax on the spaceous lawns of the museum grounds - a place where you can picnic, let the kids play, have lunch at the outside snack bar, stretch your legs,take care of your internet business in the internet cafe or even have your car washed. 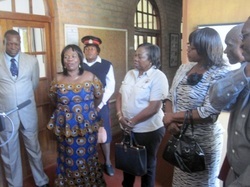 The CMCC, an NGO, is supported by the Government of Zambia through the National Museums Board. The current exhibition "Graphic Art of Zambia" was officially opened August 21st, 2013 by professor Nkandu Luo, Minister of the Ministry of Chiefts and Traditional Affairs of the Republic of Zambia, and runs through October 2013. The Minister, in blue dress, is flanked by her two deputy ministers. Click on the CURRENT EXHIBITION tab to see selected items on display and read about the artists.